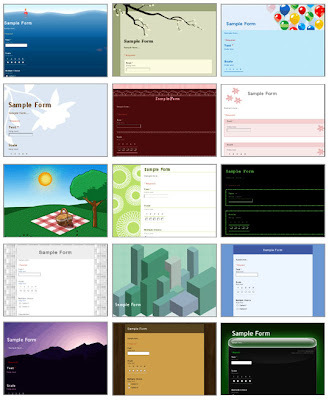 We've just launched 70 themes for forms so you can add a little (or a lot of) color to your surveys and questionnaires. Some themes are basic colors schemes (like Blue, Espresso, or Rose) and others are fancier designs (like Picnic, Zen Spring, and Dusk). How do you choose a theme? When you're editing a form, click the Theme button to find the right theme and apply it to your form. One caveat: These themes will be visible to your respondents when they fill out the form online, not within email (like Gmail). Update: Replaced an extra open paren with a comma and corrected the image. Oops.